The streamed, free event goes down tomorrow! Sign up for guestlist below! This Wednesday 28th March d&b’s rising star will be launching his debut album ‘Colours in Sound’ as part of DJ Mag at Work. The Shogun Audio label showcase will also feature sets from Memtrix, Document One and Koven. The free event, which will also be streaming via DJ Mag’s YouTube channel. The party is being held in Work Bar, Angel, London and is very limited capacity so sign up for guest list quickly here. 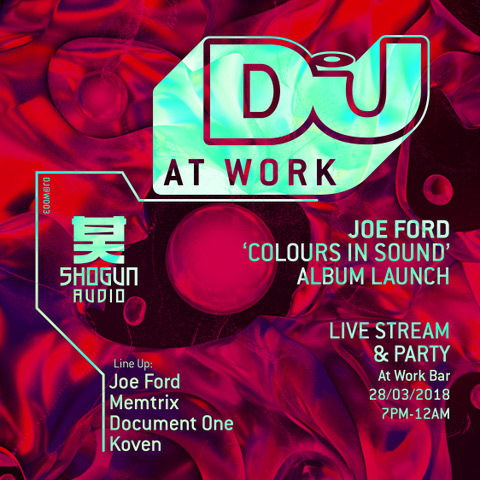 Vinyl copies of Ford’s excellent debut album will be on sale on the night along with a host of Shogun merch so be sure to get down early to see what’s on offer and to catch the first set of the night from Koven. We also have a competition on the go on the event’s Facebook page where you can win a signed copy of the record and a Shogun t-shirt so do check that out. In the meantime, check out Joe Ford’s track ‘Where is the Sun’ from ‘Colours in Sound’ below and get to polishing your dancing shoes.